This story originally appeared on April 12, 2015. The name Will Eisner is synonymous with good comics. The industry Eisner Award — the comics world’s version of the Oscars—even bears his name. Writers and artists work their whole careers hoping to win an Eisner. Eisner is most famous for The Spirit — a genre-bending series about a masked crime fighter. Most observers also give Eisner credit for coining the term “graphic novel” — and then elevating graphic novels to the level of a serious art form. Less well known is Eisner’s stint in the U.S. Army and his work for, and on, the military. War and military service were strong threads running through Eisner’s long and productive life. But it wasn’t until his twilight years that the artist finally directly addressed those formative subjects. Eisner was born in Brooklyn in 1917 to poor Jewish immigrants. His father Shmuel was a painter who had fled Austria-Hungary to avoid the draft during World War I. Shmuel settled in New York City, where relatives introduced him to his future wife Fannie. Will was one of three children. He was an avid reader of pulp adventure magazines. Much to his mother’s dismay during the impoverished 1930s, Will wanted to be an artist like his father. As a young man, he began getting work illustrating ads for newspapers and magazines. Eisner’s high school friend Bob Kane — future creator of Batman — told him he should consider going into comics. Leaping into the new field in 1936, he quickly made a name for himself. He cofounded the Eisner & Iger Studio, where he created Sheena, Queen of the Jungle. In 1940, Eisner — then working for The Register and Tribune Syndicate — first published The Spirit. Aiming for older readers, it told more complex stories than many of the superhero comics of the day did. It became an instant sensation. But just over a year into writing the book, world events drastically altered the course of Eisner’s life. Not long after striking comics gold with The Spirit, the attack on Pearl Harbor in December 1941 drew the United States into World War II. Eisner received his draft notice and enlisted in the U.S. Army. For his part, Eisner ended up at Aberdeen Proving Grounds in Maryland, where to this day the Army tests new weaponry. Initially he worked for the camp newspaper. Then the Army reassigned him to work on maintenance manuals. 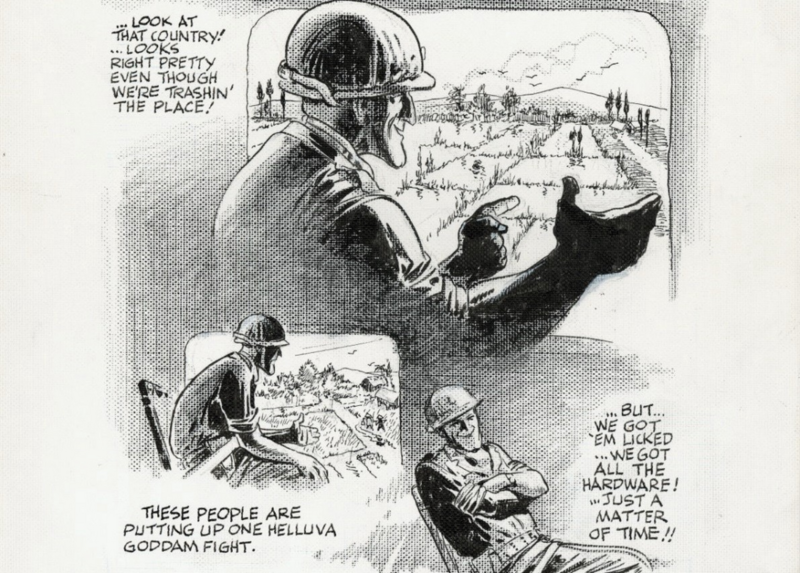 Eisner suggested he could use his comics skills to create instructive illustrations that soldiers could easily understand — an idea his superiors enthusiastically embraced. He ended up at the Pentagon, answering directly to the Ordnance Corps brass. He worked on the publication Army Motors and created a strip starring the incompetent Pvt. Joe Dope, whose misadventures were cautionary tales for young soldiers. The Spirit continued in Eisner’s absence, with Eisner’s assistants dutifully ghostwriting and ghostdrawing. 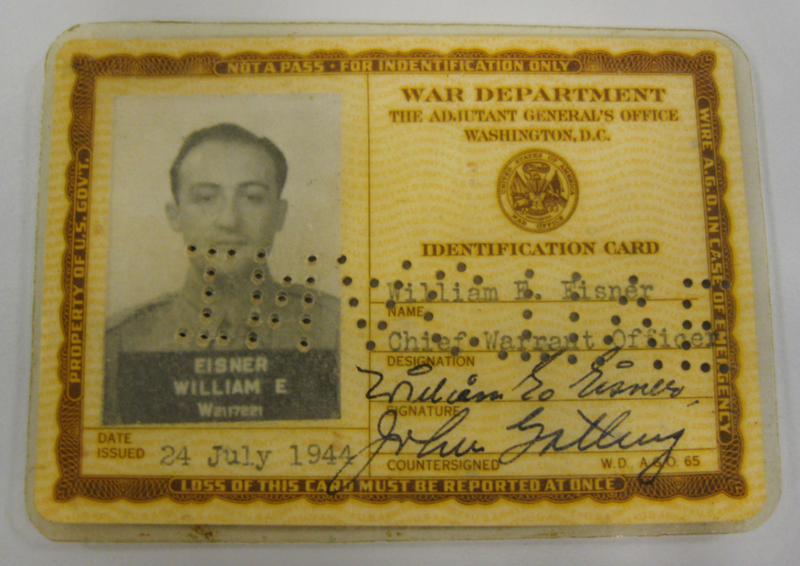 Eisner left the military in 1945 as a warrant officer. He returned to work on The Spirit, which ran for another seven years. But that wasn’t the end of Eisner’s military experience. Ironically, it wasn’t until he was a civilian that he finally went overseas and saw war up close. In 1948, Eisner founded the American Visuals Corporation, which produced comic training manuals for corporate and government clients. One of his clients, unsurprisingly, was the U.S. Army. Two years later, military officials — now waging the escalating war in Korea — approached Eisner about reviving Army Motors. Eisner and his team developed a successor, instead — P.S., The Preventative Maintenance Monthly. The new magazine brought back many of Eisner’s popular characters. That included Joe Dope … for a while. In 1955, Army brass complained that the screw-up soldier was an embarrassment. They demanded Eisner remove him from the comics. The Pentagon sent Eisner on several fact-finding missions to help him gather material for P.S. He made his first visit to Korea in 1954, just after the war. For the first time, he saw for himself combat’s devastating impact on the land, civilians and the combatants. Thirteen years later in the fall of 1967, the Army sent Eisner to Vietnam to observe another nasty conflict. As Eisner arrived in Saigon, the battle of Khe Sahn was raging to the north. The Army escorted the artist around the country by jeep and helicopter. Not long after Eisner left, the North Vietnamese Army and Viet Cong guerrillas launched the bloody Tet Offensive. Returning home, Eisner illustrated the Army’s field comic The M-16A1 Rifle: Operation and Preventative Maintenance — which became standard issue as part of the rifle’s cleaning kit. Eisner left his position as P.S.’s artistic director in 1971. He went back to comics and experimented with longer stories. In 1978, he published A Contract With God . It was perhaps the first graphic novel — and the first of many long comics for Eisner. Much of Eisner’s long-form work reflected his experiences growing up during the Great Depression. His graphic novels were about immigrants — particularly Jewish ones — and overcoming poverty and discrimination. He tangentially touched upon his military service in his semi-autobiographical comic To the Heart of the Storm. It’s the story of his parents’ respective journeys to America and his own childhood — framed as flashbacks while the soldier narrator travels via troop train to his first duty station. It wasn’t until 2000, with the publication of Last Day in Vietnam: A Memory, that Eisner finally directly retold his war experiences — some of which had haunted him for decades. The book won the Harvey Award for best graphic novel in 2001. Eisner died four years later at the age of 87.